Compressors: 200 hp; pump#1: 25 hp; pump #2: 25 hp. Brine. 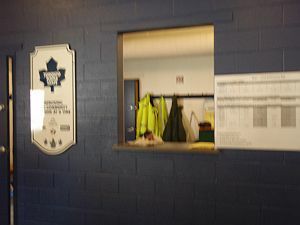 Rink change area: Recently renovated, to make it bigger and provide access to the staff. Rubber floor. MLSE logo and Maple Leaf colours everywhere, even the Parks-owned benches were repainted in Maple Leafs blue. Staff: On-site zamboni staff, a building attendant in the daytime and in the evenings, and a rink guard in the evenings (and weekends). Cityrinks.ca position paper: are helmets overrated for concussions? Should shinny hockey players be forced to wear a helmet? Maintenance: Zamboni, run by on-site staff. Ice maintenance has been contentious. The jury is still out on this one. Zamboni drivers are quite engaged and familiar with rink users. Rink was listed as closed until noon today, then listed as open. The rink was still listed as closed all day despite the very cold weather. 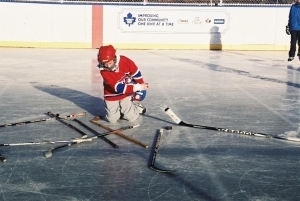 A rink user wrote: For many of us, we have to carry our equipment / take ttc trips / drive out to the park to play. Nobody is going to do this if they can't know whether the ice will be open for us when they get there. 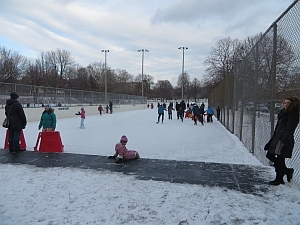 Despite the slushy weather yesterday, the rink was not listed as closed until today. 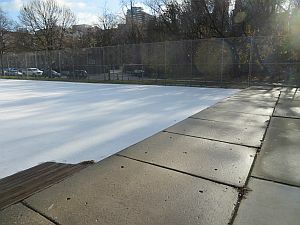 At 10 a.m. the snow had not been cleared from the hockey pad. The pleasure pad was cleaned because the Parks employee had been working on it with the Zamboni since 630 am. 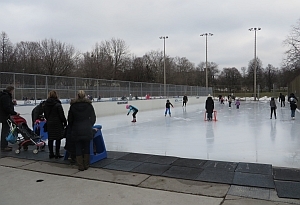 On a day when natural ice would be operational, perhaps the best day for it of the year, it seems like Parks has not put in the staffing needed. The zamboni driver tried to get a tractor in there this morning but he said they are short-staffed. But there was too much snow for the Zamboni to pick up without clogging the augers. The pylons are removed and the problems with the trapped water have been solved. The ice is fully in. The nets are positioned on the ice. The rink was flooded at 9, before the snow, so everything is ready. The zamboni driver says he will scrape off the snow for a noon game if people come to play. 2.45 pm: About 6 or 7 skaters clearing some light snow and are getting ready to play. 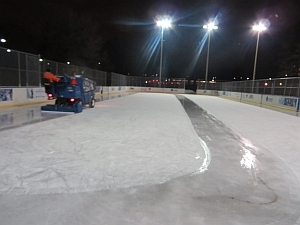 The staff said the ice is good to go and the north side is now repaired and very playable. From G. Mahood: ....at 11am today and there were still pylons running the full length of the ice along the North boards. Because the pylons are at least 5-10’ out from the boards, about 20% of the ice surface is unplayable. Unplayable unless you are a slalom skier and would enjoy skating around the pylons. The Parks people have been working very hard to give us natural ice but, after a week of work and yet no solution to the problem along the boards, I suspect we might be wise not to expect much natural ice play. After all, if there is a thaw and there usually is a thaw, we start back at zero because there is not much ice above the concrete. A rink friend says there are people playing hockey. photo by N.Cappell, Jan.14 7 p.m.
From N.Cappell, 7 p.m.: Just walking past now. 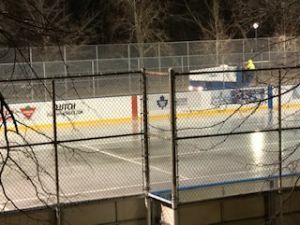 From G.Mahood: Lennox Morgan, a supervisor for the area rinks, has been out with his crew, even up to 11 pm or possibly all night on Saturday night, trying to get natural ice up and skatable. They are using hoses and Zamboni. Lennox was trying to solve a problem whereby water on the surface was freezing in the cold air but water next to the warmer concrete was not. This created huge problems near the North boards. 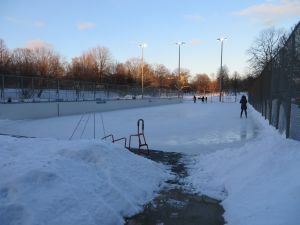 I am writing on behalf of hockey players and pleasure skaters who are among Friends of Ramsden to express our disappointment about the closure of the Ramsden Park skating pads for the 2018-2019 skating season. Moreover, we are deeply dismayed by the lack of transparency related to the reasons for the closure. 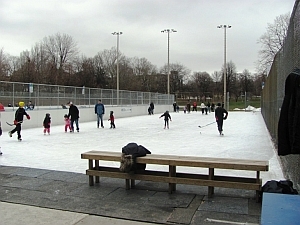 Many Torontonians, including skaters who come from a considerable distance from Ramsden, looked forward to the opening of this recreation centre at the end of November. To our considerable disappointment, we discovered that it was closed for the season. This is not a closure for a little over three months for many of us. This amounts to a closure for an entire season or year. Mayor Tory, Ramsden is not just an opportunity to play a little hockey or to take our kids for a skate. We have a community here. The social engagement, the physical exercise, the opportunity to be out-of-doors in the middle of often grey winter days, all combine to make Ramsden special. Skaters having to move to other rinks, often distant from public transit, is seldom an acceptable response to closed skating pads. 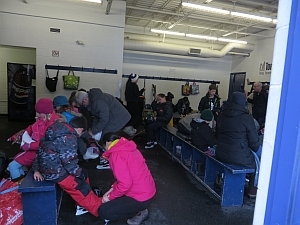 With hockey for example, players travelling to other already overcrowded rinks where 20 players are shoehorned into players’ benches often leave extremely disappointed with the lack of playing time. Others look at the numbers already present and walk or drive away. For these reasons and more, this loss raises a number of questions about the equipment malfunction, not all of which may be answered by the freedom of information inquiry that we have just filed. Perhaps your staff can do some research and provide some answers. 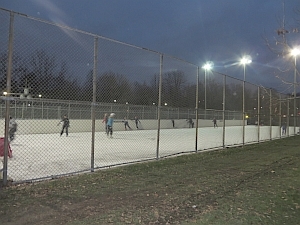 This is the only central Toronto rink listed as closed this morning. Yesterday and today Ramsden Rink is listed as open "hockey side only." This rink is listed as open for the first time today. At 11 a.m. the rink gates were open but it was not ready for skating. A friendly and courteous rink attendant explained to people inquiring, that the rink still needs one more day for floods but can probably open tomorrow. The rink shows the evidence of not much water put on yet -- pebbly with a big space between the boards and the ice. This rink never opened today, although on the schedule it was supposed to open. 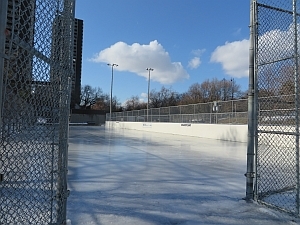 This rink was scheduled to stay open until March 20, but was finally listed as closed for the season on March 12. On the city's website schedule, Ramsden was blank for New Year's Day. That would ordinarily have meant the rink was closed completely, but it was open. There were lots of skaters and the change room building was open and full of people as well. 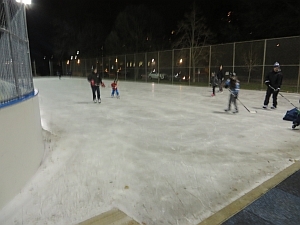 Jimmie, the zamboni driver, said that they opened at 9 and started right off with a neighbourhood shinny game. Long-time rink advocate Gar Mahood was one of the players. All the city's outdoor rinks were closed today until later afternoon, because of the heavy, extremely wet snow. Ramsden was among the first bunch to re-open, around 5 pm. 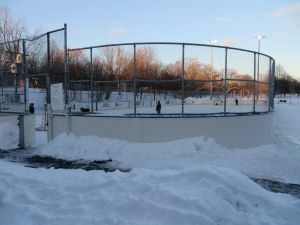 This rink was marked as closed, on the city's website, on Christmas Day -- for the first time in years, since there has been a long tradition of a Christmas morning shinny game. The ice was most likely fine. Was it really closed? It was marked as open again on Boxing Day. The rink was open with skaters on both sides. The operator, Rob, said that because of his work schedule they hadn't been able to start ice-making until Wednesday, but then they went over the rink every hour (but no night floods). There was still snow on the slab from before,and they were able to use that snow to build up the volume. They started with cold water for the first day and then went to hot water floods with the zamboni. Rob said that he and his partner Jimmy have got their routine down to a science, and that he has had four letters from mayors, commending his work. Even though the temperature never got above 2 degrees today, there was full March sun, and the pleasure-skating side looked bad. At the time of our visit, the zamboni was grooming the hockey side, which looked pretty good although the zamboni made a crunching sound on the ice as it went around. There were very few people at the rink -- five skaters on the pleasure-skating side, two people inside, perhaps waiting for the hockey side to open. At noon, the rink had plenty of skaters and the building was open. Staffing was a zamboni driver and a building attendant -- the driver, to maintain the ice, the building attendant to help keep the building open, so that skaters could change inside (it was a very cold wind) and store their equipment, and have washroom access as well. Their holiday hours for the building were 9 am to 6 pm. Meantime, most other downtown rinks had the change rooms/ washrooms locked. Why? 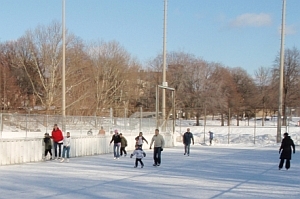 The rink was open (not only the ice but the building too), as advertised on the city's website. Lots of skaters, plus the zamboni driver and one rink guard. 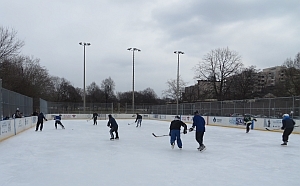 Lively shinny hockey game -- every single skater was wearing a helmet -- very unusual at center-city outdoor rinks. At 7 pm the ice looks terrific. 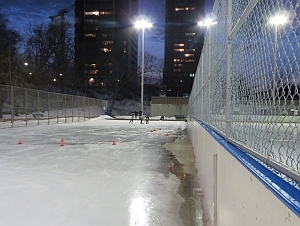 Ramsden is one of the rinks that kept its ice despite the warm day on Nov.24. Ramsden's opening day has been moved up to Nov.22, even though the individual schedule on the city's website doesn't start until Nov.29. The ice looks good, and ready to start. 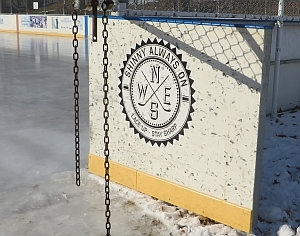 unusual logo on the hockey gates: "lace up - stay sharp"
Good ice. Change room open. Some dads inside, talking stocks and hockey. I have no idea if this will be useful to you, but I just thought I would send some comments on Ramsden which I went to last night for the 5:30-8:15pm 19+ shinny...at least the 45 minutes of it I lasted for. The ice condition was good, more than thick enough for a game. It was busy but well organized so quick changes and a fast pace even with 4 on the bench, although only briefly. Staff were incredibly friendly, helmets are mandatory, and they were able to lend me one (even said "no, thank you for wearing a helmet" after I had thanked them). They even treated a guy who was cut by an errant stick. Anyhow, A+ experience. 7pm-8:45pm Adult Shinny was quite crowded. Almost overwhelming numbers. It was 5-on-5 hockey and the benches could scarcely hold all the players waiting for their next change of shift. Still, the firm one puck rule is impressive as compared with Dufferin where multiple pucks and people playing in different corners of the rink -- and nearly running into each other -- is common. 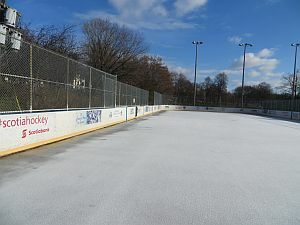 A recently maintained surface was chewed up quite quickly with the amount of hard skating and the number of players. The ice maintenance is quite regular and frequent at this rink. For the skating schedule, go to Ramsden, then click on drop-in programs then click on Skating.